… But at least you aren’t on a bicycle. Or so that’s the message being portrayed by the local newspaper’s automobile section. Every year we see more and more bicycles on the streets here in Toronto. Instead of acknowledging that more people on bicycles means less traffic congestion for car drivers, many drivers seem to see bicycles as a threat. Last week we wrote about a tabloid columnist who wants to ban bicycles in the city because he seems to think a 3-foot bike lane is the cause of the long line of traffic he sits in when he drives into the city. Now the Toronto Star’s automobile branch, “Wheels.ca” has posted a video of people on bicycles in the Netherlands getting caught in a severe crosswind to portray bicycling as an inconvenient hassle. There is some amusing irony in the fact that an automobile newspaper is using, of all places, The Netherlands as an example of a terrible commute in order to rationalize wasting their life away inside an automobile, while stuck in traffic, always running 30 minutes late. “Nobody loves the morning commute. Except the Norse gods. 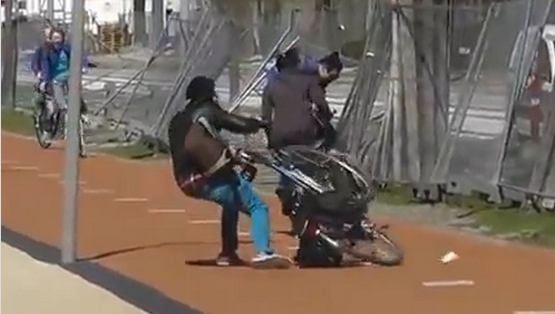 Because watching Dutch cyclists battle gale-force winds ON THEIR BICYCLES is the most entertaining part of their day. So the next time you’re locked in traffic on the Gardiner, the DVP, the QEW, or any of the other arteries into and out of downtown Toronto that, let’s face it, no longer work, just think of this video. And remember, yes, you’re stuck behind 30 tractor-trailers and you’re half an hour late. Half an hour late, stuck behind 30 tractor-trailers. But at least you aren’t stuck on a bicycle in the Netherlands. It is truly remarkable how defensive the media has become in its attempt to preserve our society’s automobile culture. Bicycle transportation truly is becoming a serious mode of transportation in our city, and this is reflected by the media’s incessant attempts to downplay the convenience and pleasure of bicycle transportation. Below is a video that better reflects the average daily commute in the Netherlands. These people are in fact enjoying their morning commute. But don’t send this video over to the editors at Wheels.ca. They wouldn’t have anything to complain about if they actually enjoyed their morning commute and made it to their destination on time. Hat tip to Sheenagh Murphy for pointing us to the Wheels.ca article. We can easily counter with Russian dash-cam car crash videos, and cars sliding down hills on ice. Ha-ha, look at the stupid people driving carelessly and smashing their cars into bits. Ha-ha, look at those big heavy lumps of steel sliding down the icy hill, no way to stop it. For those of you who’ve never been here, these kind of gale-force winds are pretty rare. We do have a lot of wind, so riding a bike can be hard work, but most of us manage to reach our destinations without being blown into the canals or, worse, the path of a lorry. Both Niagara & Burlington skyway’s have been closed do to high winds. I remember as a kid travelling over them on windy days and was beyond scared…More so when (more than once) 18-wheeler’s in front started to sway. I believe on windy days they have those electric signs warning people to use caution. Other then slowing me down, I’ve never had an issue with wind. 2 or 3 years ago when Southern Ontario was hit by that wind storm (100km/h+) I had to go out. Slowed me down and I had to make sure both hands were on the handlebar. Though watching the passing motorists, they weren’t much different, most with white knuckles from gripping their steering wheels. Great post. The beauty of the video of the cyclists caught in the crosswind is on their faces – all smiles. They’re having great fun. You don’t get that driving to work! That’s a hell of a wind – it’s blown all the wire fences over, too. I wonder what it does to the famous Dutch windmills? … As far as weather and cars go, I always notice how a little bit of rain will make the evening rush hour even worse. Norse Gods in the Netherlands? This dolt needs a geography lesson. Even with strong winds blowing their bikes over, the people are still smiling. You don’t see too many smiles in a traffic jam.